When Jeana and I met for coffee the other month, can you guess what we randomly started talking about? If you guessed food sensitivities and trigger foods then congratulations you’re correct! I mean, what other things do health nuts talk about over coffee? We both quickly established our love for pizza and our hardships over gluten. I tend to follow an almost gluten-free diet by simply eliminating processed foods from my food regime and sticking to nutritious, whole foods. The easiest way for me to do this is planning and following the weekly lunch bunch guide to packing lunch. Outside of my beloved snack of almond butter or avocado on gluten-free toast, I’m sticking to nutritious gluten-free grains, protein and lots and lots of greens for my meals. I am human, however, and I can’t say that I’m not tempted by a sweet scone on a Sunday morning or Chicago-style pizza the night before. This is exactly why I went looking for a gluten-free pizza recipe option for those days that I simply want to enjoy a dish that I love without the stomachache or guilt afterward. I am a huge fan of Danielle Walker’s blog, Against All Grain, which provides grain-free, gluten-free and dairy-free recipes for people with food sensitivities. Danielle shares how simple it can be to make all our favorite recipes without sacrificing flavor. In the end, I relate most to her message that she sends about listening to one’s own body. We all react differently to foods and have unique sensitivities, so do what is right for you. Give yourself the energy you need! This gluten-free (and grain-free) crust combines three different flours to get the desired end product. This is typical of most gluten-free flours, as each one attributes their own properties to give the right combination of texture, taste and structure for the specific dough. I promise that it is worth the effort … and it really only took me 20 minutes to make the dough. I topped mine with sliced eggplant and portobello mushrooms for a light, spring meal. I also love to make an arugula salad to top on any pizza. The bitterness from the arugula & the tart citrus from the lemon are a perfect addition and one of my favorite toppings. (Not to mention that I’m adding more greens to my meal!). I hope that you can find from this recipe that you CAN have your cake and eat it too (or pizza in this case). 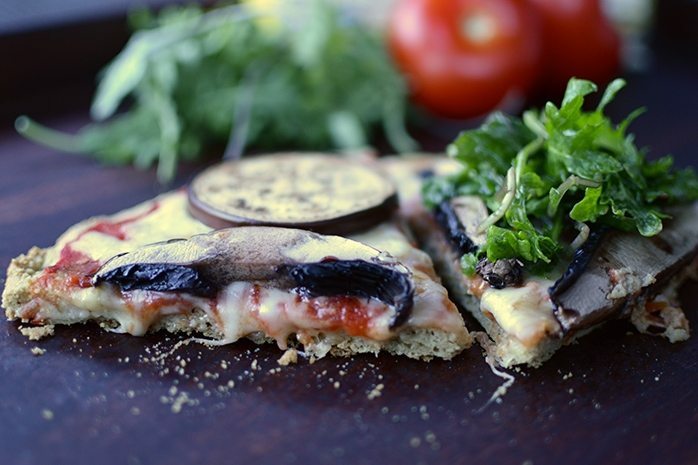 Grab a slice using this recipe atop Against All Grain’s grain-free crust. In a food processor, pulse the cashews until a fine flour has formed. Add in the almond flour, coconut flour, baking soda, salt, and garlic granules, then process the mixture for 30 seconds. Add the eggs, almond milk, apple cider vinegar, olive oil, and water and process for another 30 seconds. Scrape down the sides of the bowl and pulse a few more times until you have a very smooth dough. Add the parsley and basil, and pulse two more times to roughly chop and incorporate the herbs. Let the dough rest for 2 minutes to let the coconut flour absorb some of the liquid. *It is a fairly wet dough, so don’t be alarmed that it doesn’t come together into a dense ball like most doughs. Use your hands to flatten the ball into a disc, then lightly roll out the dough into a circle that is 1/4 inch thick. Remove the top piece of parchment and carefully by gently tugging from one corner. Slide the other piece with the crust onto a pizza pan. *If you can’t remove the parchment without taking half of the dough with it, just bake the crust with the top piece intact. You can remove it once the crust has baked and before you add the toppings. Bake the crust for 12 minutes, or until it has puffed up and is golden brown around the edges. Top with marinara sauce, cheese, salami, sausage, bacon, mushrooms and olives and bake for another 10-15 minutes.